People laughed at John Dee for years, dismissing the astrologer as a madman or a fraud. Then one day a face appeared in his mirror, a face that was not his own. He was given secrets from beyond time: how to mix potions; how to tame the elements; even how to trap a demon. But Dee’s magic was lost, his library ransacked, his spells and hexes stolen. A dread prophecy was made: “The Earth will burn”… When the TARDIS lands on a Spanish galleon, caught in an unnatural storm, the Doctor, Alex and Brandon are shipwrecked and separated from each other. Between them, they must discover who is waging supernatural war – before the planet is pulled apart. What connects John Dee with Sir Francis Drake and the impending attack of the Spanish Armada…? This is the third of four single-CD audio originals – but if you haven’t heard the previous episodes, don’t worry. Writer Cavan Scott finds a neat way of recapping the story so far, as the Doctor tries and fails to explain the reason for his visit to an incredulous 16th-century Spanish sailor – well, he did ask! After losing my interest a bit during the last instalment, the series gets its magic back with this engaging tale involving the Spanish Armada, Sir Francis Drake and, most intriguing of all, John Dee. The latter was a mathematician, astronomer, astrologer, occultist, and advisor to (and possibly a spy for) Queen Elizabeth I. He spent much of his later life trying to communicate with angels in order to learn the universal language of creation – something that proves highly relevant to the plot of this audio adventure. While the Doctor and his companion Alex interact with Dee, fellow traveller Brandon’s knowledge of history comes in useful when he meets Sir Francis Drake. Dee, Drake and the Armada have appeared before in numerous works of licensed Doctor Who fiction (not always together), but Scott manages to find something new to do with them. 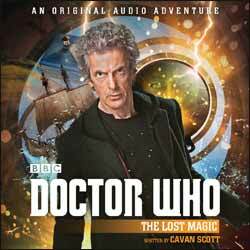 The Lost Magic is read by Dan Starkey, better known as Strax the Sontaran. No reader so far in this series has got the voice of Peter Capaldi’s Doctor right, and Starkey is no exception, despite providing an otherwise proficient performance. His Twelfth Doctor sounds more like Bob Geldof – I can almost hear him shouting, “Give us your magic NOW!” Starkey is far more successful at imitating Jon Pertwee and Tom Baker’s incarnations when the climax goes a bit Brain of Morbius… but again I mustn’t spoil it for you. After all, if you wanted to know the future, you’d look in a scrying glass, wouldn’t you?